Last night I headed out with a bunkmate named Antony from Australia. We had some drinks and got rained on while walking around the city. We passed through the red light district which seemed pretty wild at night. 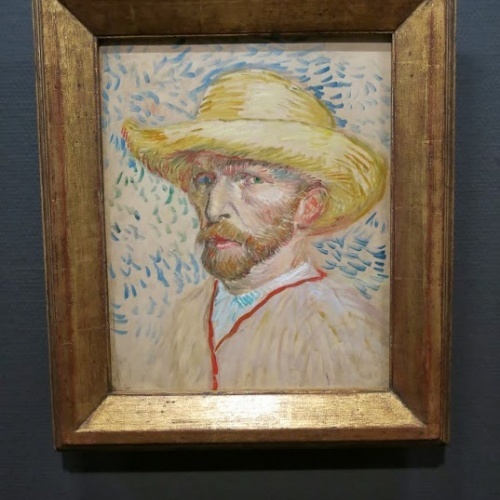 This morning I took my time eating breakfast, answered a few emails (from up in my room... the WiFi here has been having some MAJOR issues lately but it appears to be cleared up now), then set out just before lunch to see the Van Gogh Museum. 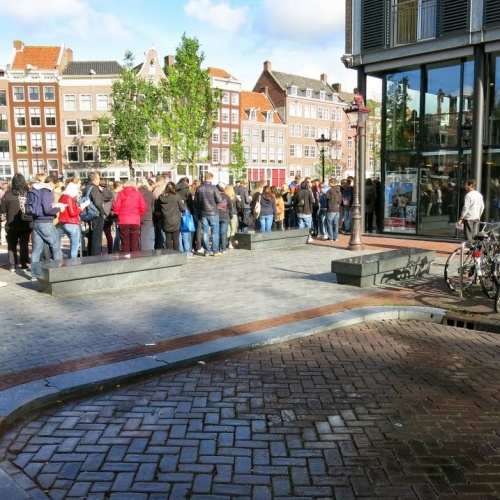 I picked up a ticket by the I Amsterdam statue which got me in a "fast track" style admission line. It didn't cost any more but it saved me about 45 minutes worth of waiting in line. They only let people in every 2 hours to keep the amount of people in there from being too crazy. My ticket let me in at 1:00 so I had a sandwich and read by the I Amsterdam statue. With about 15 minutes before entry, I went to the museum and still had to wait in line. It went really fast though and I was in the museum pretty soon after 1. 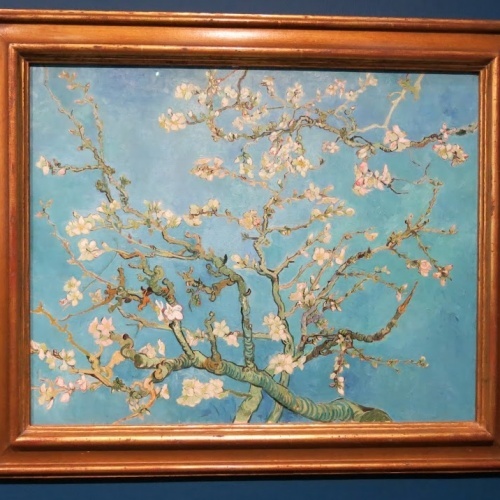 The museum had several floors full of Van Gogh's work plus some other people who inspired him. 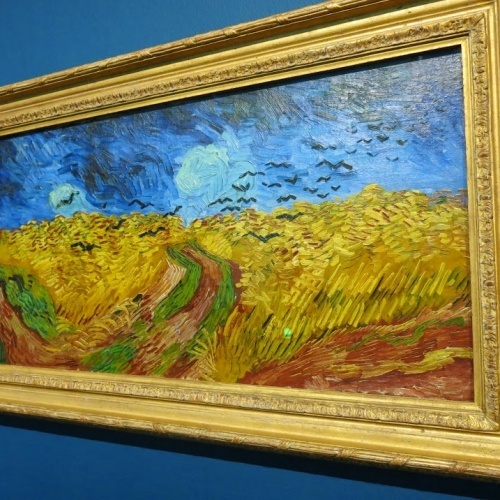 I got to see a lot of his most famous pieces up close. Unfortunately Starry Night wasn't there. I was looking forward to seeing that one. I spent 2 hours walking around and figured I'd leave before the next mass of people came flooding in. I bought some mixed veggies for dinner then came back to the hostel. It appears the WiFi issue has been fixed and it actually works down in the lounge now. Hopefully it stays that way tonight. I have all day tomorrow to kill in Amsterdam before boarding my train to Berlin tomorrow night. I still need to print my train tickets. I'll either do that at the hostel if they're able or I'll have to find an internet cafe. Today I went to the Anne Frank House. It took about a half hour to get to the ticket counter. Once inside it felt a bit like a cattle drive where there was just one continuous line that you followed as you made your way through the various rooms of the old house, attic and warehouse that made up the museum. Putting the sheer number of people aside, it was actually humbling to see where her and her family and four others spent several years. The museum had excerpts from her diary and journals everywhere and most rooms had history about what happened there or what the room was used for. I ate lunch outside the museum then, once again, aimlessly walked around Amsterdam. I eventually stumbled across the red light district and walked through there and then Chinatown. The smell from all the food in Chinatown was making me hungry again. 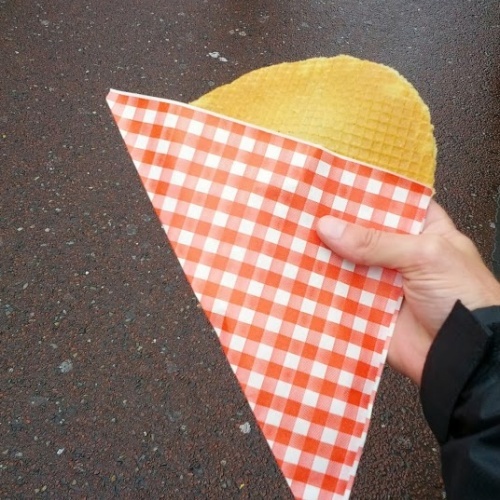 I stopped for a beer and then went back down to the Albert Cuyp street again and bought another giant stroopwafel as a snack. Back at the hostel I did a little work offline (the wifi here is obnoxiously horrible). I found out that I can get a shred of internet if I work in my bed. The wifi in the lounge simply won't connect either my phone or laptop. I bought some wine that I'll have tonight with dinner. Not sure what I'll do after that. I guess it depends on whether or not it's supposed to rain. It would be fun to see Amsterdam at night but I don't feel like getting drenched. I just wanted to walk around today and check out the various zones of the city. 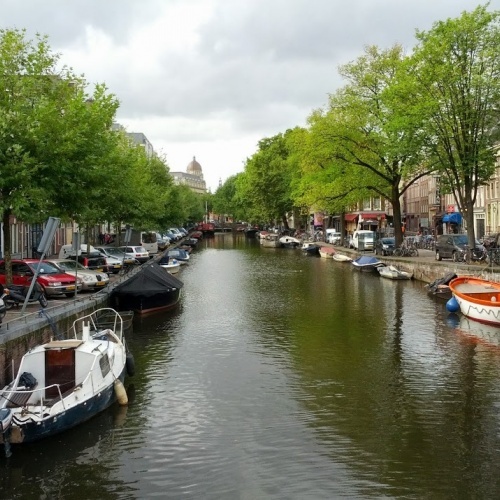 I went up to the Haarlemmerdijk street and then just walked around. Eventually I went down to Albert Cuyp. That's a street that on Wednesdays is basically one giant market street. 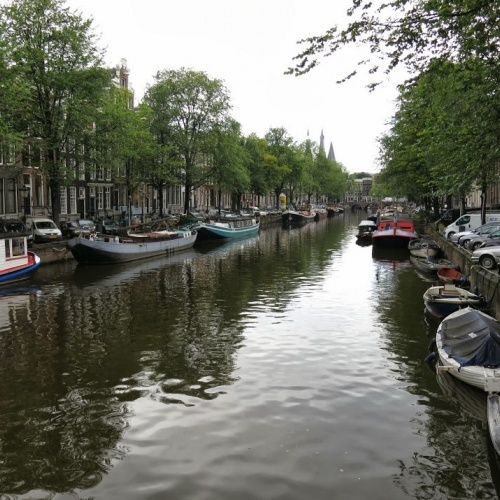 I read on the tourist map they gave us at the hostel that Albert Cuyp is where you go for stroopwafels. 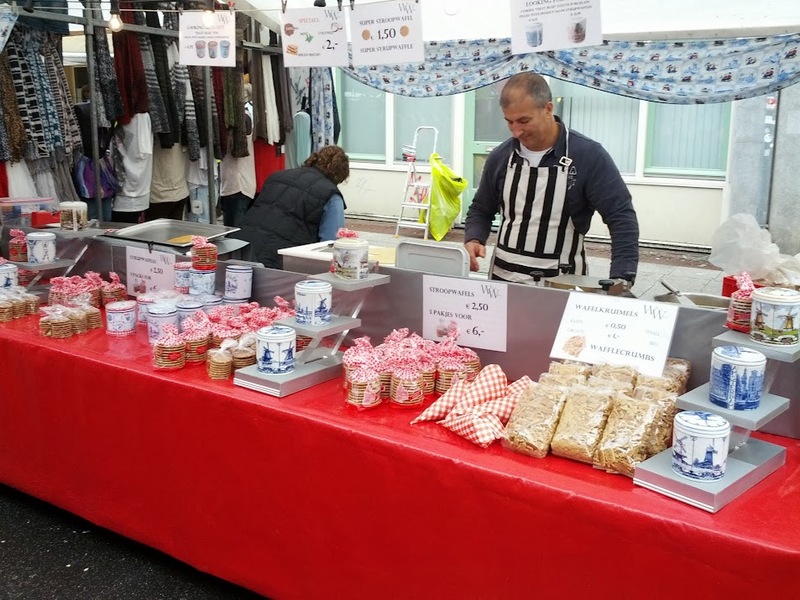 If you've never had a stroopwafel, they're amazing. 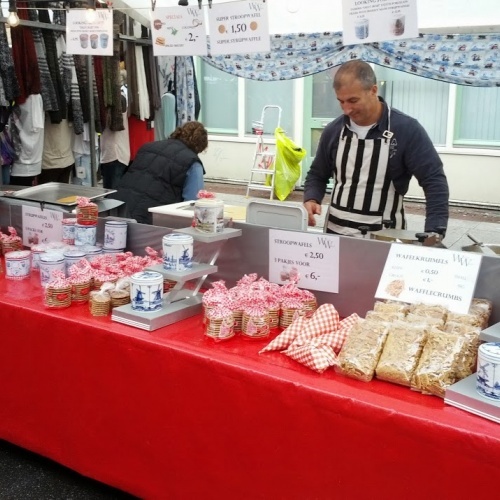 Check out the stroopwafel page on Wikipedia for more information about them. 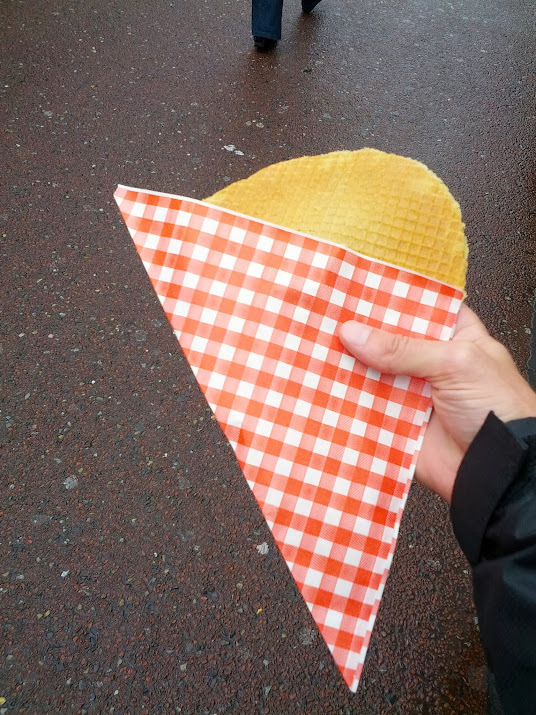 They're essentially really thin soft wafer/waffle cut in half and filled with a caramel syrup. When served fresh and hot they're amazingly delicious. I got to see them make it fresh in front of me then carried it around through the market. I ate it pretty quick before it had time to cool off. I came back to the hostel to work a bit, then went out and got some bread, apples and oranges. I also got some pasta sauce so I could make some italian grilled cheeses for dinner with some cheese I had bought yesterday. After dinner I went out and walked around Vondelpark for a while. It's a huge park just outside the hotel. Even in the rain there were a lot of people out running, jogging and bicycling. I was getting tired of the constant switching between rain and sun so I came back to the hostel and watched the latest episode of Dexter. Tomorrow I'm going to try to make it to the Anne Frank house. I walked by this morning but the line was ridiculously long. 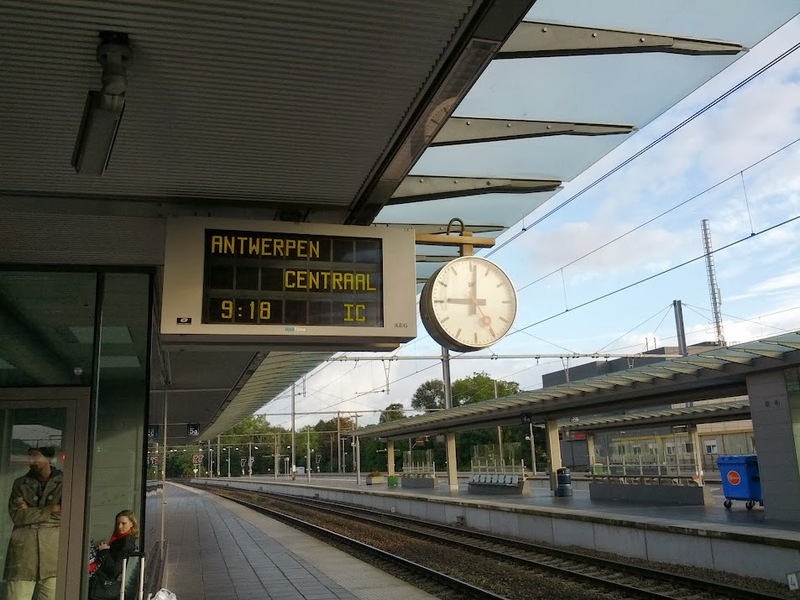 I was a little unsure if I'd make all of my train connections from Bruges to Amsterdam but each train was on time and all the connections went flawlessly. I left Bruges at 9:18 this morning and arrived in Amsterdam at 1:08 this afternoon. The first thing I noticed when I got out of the train station in Amsterdam was the sheer amounts of people here. Aside from perhaps Dublin, these were the most crowded sidewalks I've seen this trip. One really cool thing here is all of the bicyclists. They're everywhere! They have just about as much street space as the cars do. When I was trying to find my hostel I got a little turned around and walked through a lot of the secondary streets here. Finally I made it to my hostel and checked in. So far this seems like your ordinary hostel except for the smoking room they have down in the bar/lounge area. It's a separate room with an exhaust so the smoke doesn't get into the rest of the place. I walked around a little while but due to the amounts of people and the weather I didn't go too far. I made dinner and then attempted to go for another round of exploring but it started raining. I didn't really feel like being cold and wet tonight. I think tonight I'll just chill here at the hostel and get up early to go explore around tomorrow. 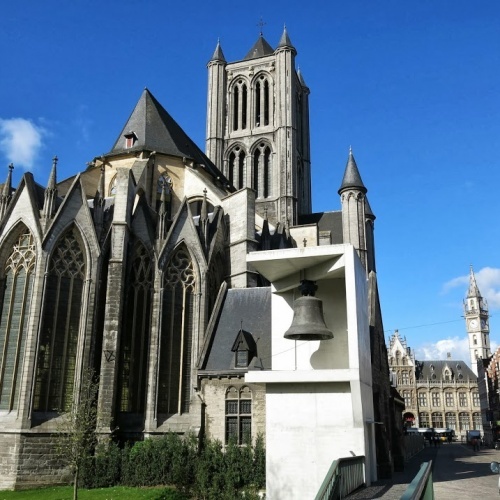 I wanted to see a different city today and Gent was on my list before I left the States. 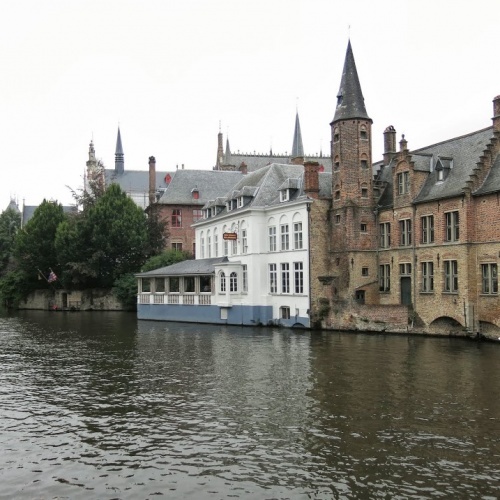 It's a 30 minute train ride from Bruges and the trains run very regularly. 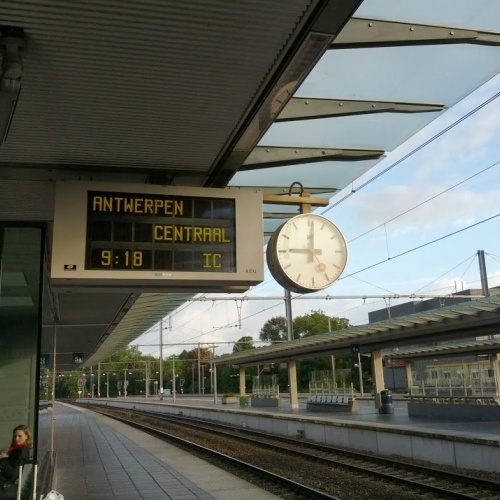 I went to the train station today to pick up my tickets to Amsterdam and buy a round trip to Gent. The lady at the ticket counter couldn't figure out what to do with my confirmation code which was pretty frustrating. To make it even more frustrating, I couldn't pull up the email with the information since there was no wifi available at the train station. I said screw it and figured I'd get it all taken care of later. I jumped on a train to Gent and watched the countryside pass by through the window. 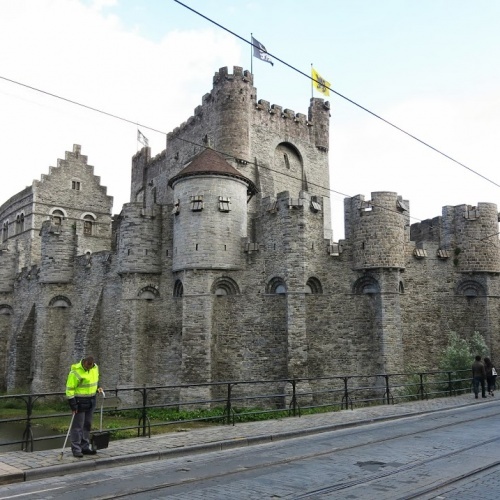 When I got to Gent I jumped on a tram that took me to the city center. 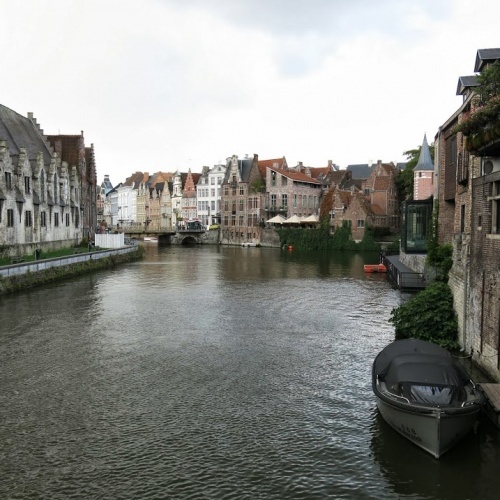 Gent is a lot bigger than Bruges and has more of a "real city" feel. The old city center area was nice but I felt like half the place was under construction. A lot of the statues and buildings were surrounded by scaffolding and tarps so they could do whatever maintenance they needed to. I walked around for a few hours and took some photos. There was some free wifi outside a McDonalds so I took a screenshot of my Amsterdam train ticket email and figured I'd try my luck getting the ticket printed at the Gent train station. Rather than hang out in Gent all day aimlessly wandering around, I jumped on the tram back to the train station and successfully printed my ticket to Amsterdam. There was a train leaving back to Bruges a few minutes later so I got on it. Back at the hostel I did some research into hotels in Paris. The hostel is getting pretty packed earlier than normal. A lot of English people just checked in and they're all hanging out drinking. 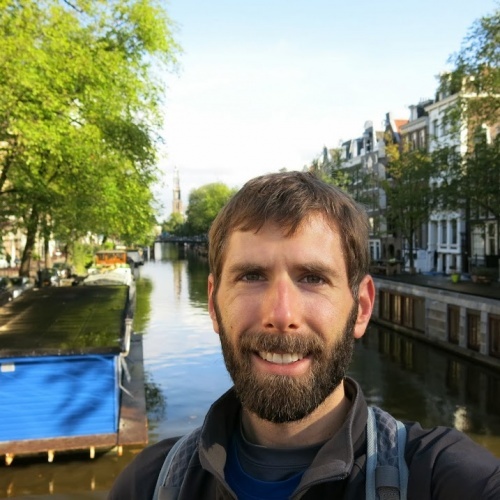 After this blog post I'll probably get some dinner going and then have a drink at the hostel bar. The first stage of my trip to Amsterdam leaves at 9:18 tomorrow morning so I won't stay up too late tonight. The weather today was beautiful. I got up early, ate and then set out to explore as much of the city I could without the interference of rain. 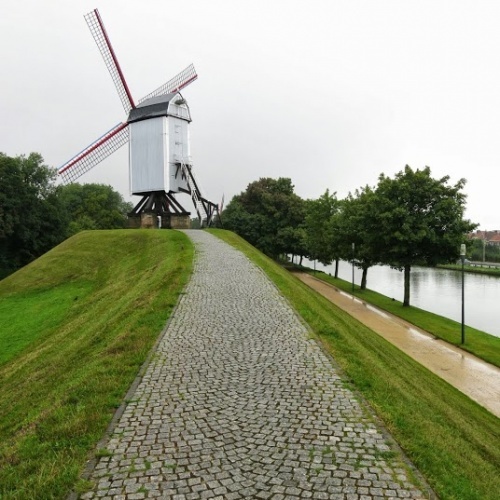 I walked by canals, through parks, through markets that took up several streets, and by the windmills again. I covered a ton of ground today and got some great photos along the way. A few hours after I ate lunch I was getting hungry again so I stopped in a chocolate shop and got what was essentially a chocolate rice krispy treat and ate it by one of the canals. The windmills looked great today with blue skies in the background. I got a few photos that I'll probably upload to indePrinted when I get a chance. The town was packed today too. I'm not sure if it was due to the weather or the fact that it's a Sunday or a combination of both. There were massive groups of people on tours that blocked entire streets. After walking around town for about 5 hours I came back to the hostel to do some planning for the rest of my trip. I was looking at the map and train routes and prices and figured I should probably get a more defined route ready for the next month of my trip so I make sure I'm in Paris by the 21st of October. It looks like after Amsterdam I'll head to Berlin, from Berlin to Prague, Prague to Vienna, Vienna to Verona, Verona to Vernazza (the Cinque Terre) and that's as far as I've got so far. Ultimately I'll end up in Naples so I can see Pompeii. From Naples I'll get a train to Rome and then from Rome there's an overnighter to Paris that will get me in on the 20th. The unrelenting rain finally returned. I've done my fair share of walking for today so I'll just eat dinner and hang out at the hostel the rest of the night. 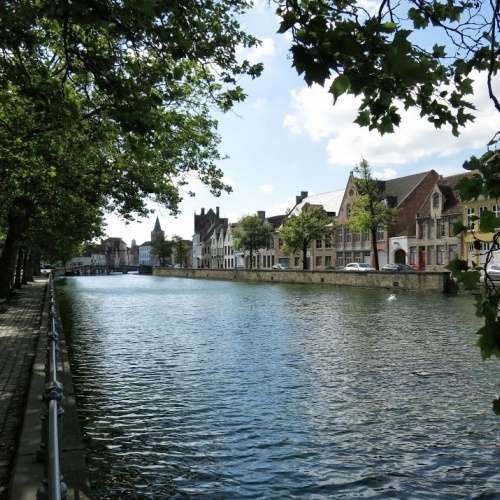 Tomorrow I'm planning on visiting Ghent for the day since I've seen just about every nook and cranny here in Bruges. Last night I hung out in the hostel and had a couple of beers. They have a happy hour from 9-10 each night where one of the draft beers is only 1 euro. After two beers the rain had stopped and it turned into a really nice night. Instead of going to bed I decided to head out and see Bruges at night and take some photos. It was gorgeous at night! The rain must have scared a lot of people off so I was able to take photos from some of the prime spots without any interruptions. This morning I woke up to rain again. 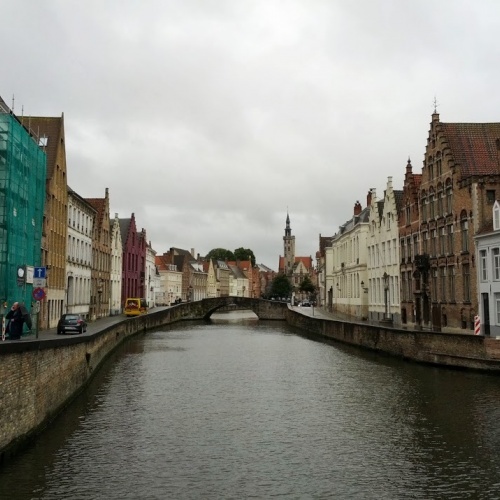 Apparently this is nothing out of the ordinary since Bruges is known for its rainy climate. Even so, when the weather sites are calling for 90-99% chances of rain, you know you're going to get wet. 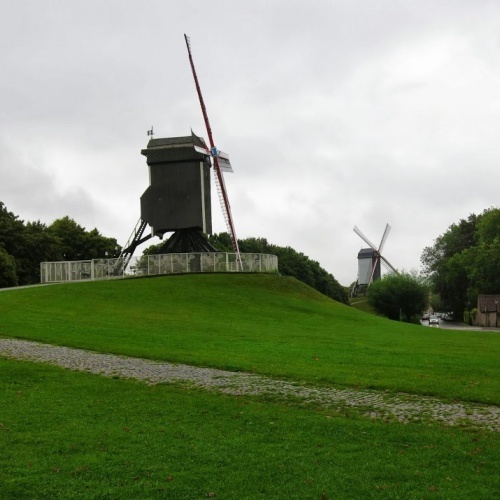 There are four windmills on the northeast side of town that I wanted to see. After eating breakfast I put on my rain coat and headed out into the drizzle. It took about 15 minutes to walk over there but I finally got to them and got some photos. Between the 3rd and 4th windmill it started downpouring. I sought shelter under some trees and waited for the worst of it to end. Finally the rain let up enough for me to feel confident in heading out again. I took some photos of the last windmill which was the only one that didn't have some sort of fencing around it. From the hill the windmill sat on you could see some nice views of the city. It's too bad it was so rainy since all the moisture made it hard to see all the towers in the distance. 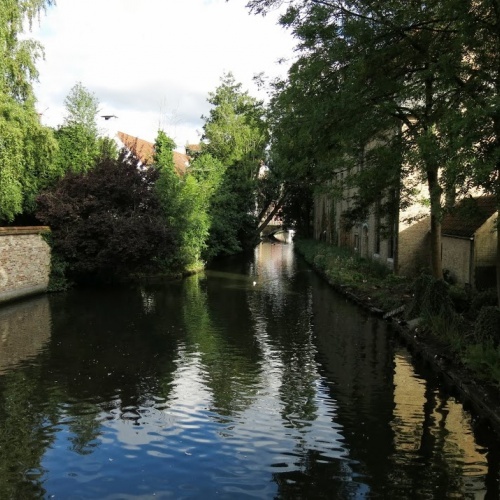 After that I wandered around and came across some canals with some really nice views. 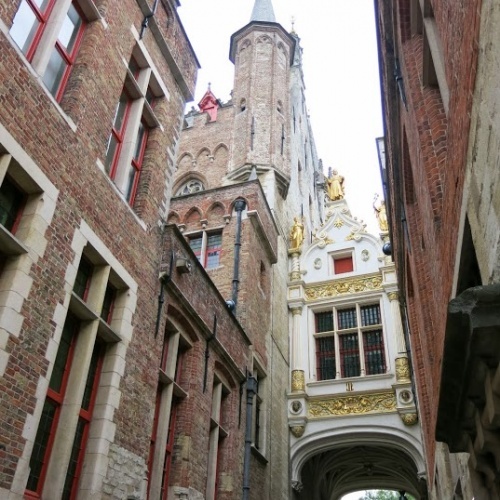 I grabbed some photos there and then went to the Grote Markt to eat lunch. Right after I finished my sandwich the skies opened up again. Rather than deal with the constant wetness I came back to the hostel to avoid the rain. 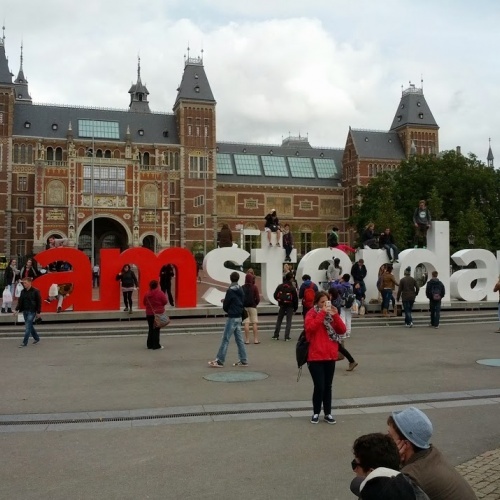 I used my time at the hostel to book my travel to Amsterdam for the 17th. 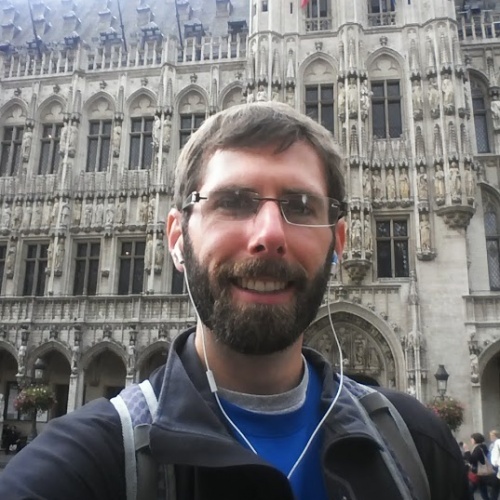 I wanted to stay in Belgium another few days but both Gent and Leuven didn't have any reputable hostels with availability for the weekend. Amsterdam also didn't have any availability for Saturday night in the decent hostels so I've booked Tuesday - Friday night there. 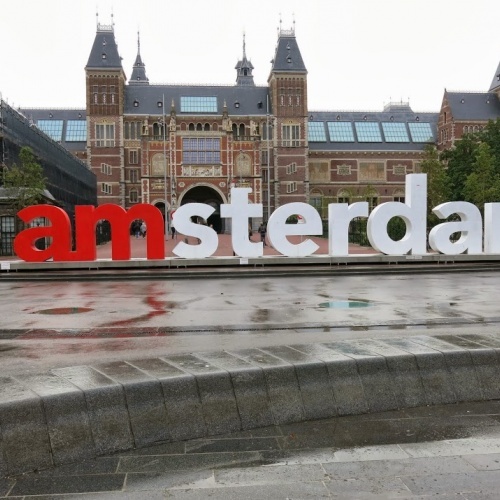 Depending on how I feel after 4 nights in Amsterdam I might try to find another hostel with availability for Saturday night or I'll just head out somewhere else. 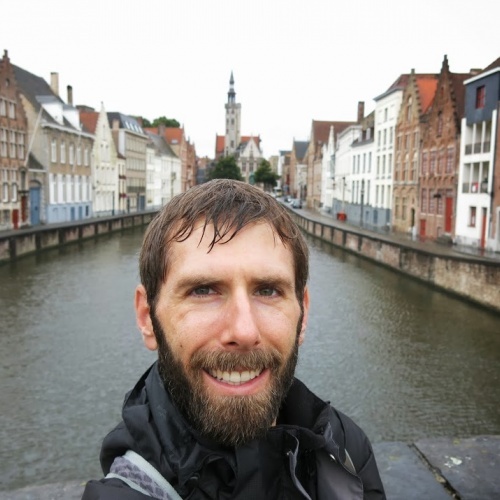 Once I booked my travel and hostel it was still raining outside so I downloaded In Bruges and watched that while I'm... In Bruges. It was cool seeing some of the sights I've already been to in the film. Aside from it being filmed here, it's a good movie too. I bought a "beer card" for the hostel for 10.50 euros. It lets you drink 5 different beers which evens out to being a little cheaper than buying all of the beers individually. I'll have a couple of the beers tonight and then see how the weather is. If it's nice I'll probably go out for another walk. Looking up at the sky I can see some blue peeking through. It looks like the rain might finally be over for a while. Tomorrow is calling for no rain which would be a nice change. The ticket I bought for Bruges yesterday didn't have a specific time and the trains run about every 30 minutes, so I wasn't in any kind of rush this morning to get ready. One issue that had been plaguing me during my stay in Brussels was my key card for my room at the hostel kept getting deactivated. I was on the 4th floor so every time it happened I'd have to walk all the way back down to the lobby and then back up to get it fixed. I was planning on getting the 12:21 train so I left the hostel around 10:30 and hung out in the Grote Markt and had lunch there. The skies started clouding up and it felt like rain was coming any second so I went to the train station a little early. I looked at the schedule and rather than wait around for an hour and a half I decided to get on the 12:00 train. It ended up being delayed by about 10 minutes but once I got on the ride was fine. It rained a bit but the countryside was nice. 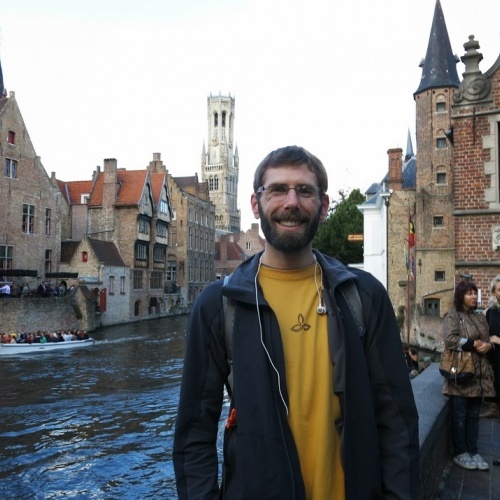 When I got to Bruges, it wasn't really raining hard but it was just enough that I needed to put on my rain coat. 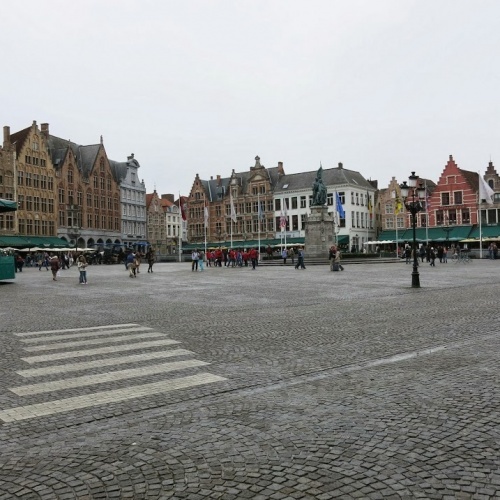 When I left the train station I headed toward the Grote Markt in Bruges. The town is beautiful! Even in the gloomy weather the town has a certain kind of charm to it. I took some photos and then went to seek out the hostel so I didn't have to lug my big bag around with me. After checking in I went to a big supermarket to get some stuff for dinner. I ended up getting a green pepper, an onion and some oranges. I didn't realize you needed to weigh, bag and print prices for all the produce you buy. When I walked up to the cash register they had to call an employee to run back and scan everything for me. It was pretty embarrassing since I don't speak any Dutch. It's close enough to German that I can understand some stuff but there's no way I can try to put together a worthwhile sentence. Anyway, after that got figured out I came back to answer some emails and do a little bit of work that I wasn't able to do on the last hostel's extremely slow internet. After that I set out to find some frites to eat as a snack. I had some that were pretty good, although the ones in Brussels were better. 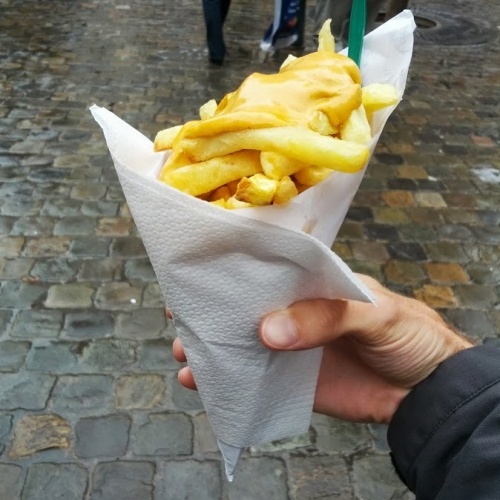 These frites were a little thinner cut. They were still super crispy and delicious, but I liked the super crispy thick cut frites that I had in Brussels. Back at the hostel I made some vegetable curry for dinner and now I'm working on this blog post. Every night between 9-10 the hostel has a happy hour where their already cheap beers are discounted even more. I'll probably hang out here at the hostel tonight and have a beer or two tonight. The weather tomorrow is supposed to be nicer so I'll try to do all of my exploring of the city then. There's a 7km walk around the old city walls that I want to try too. 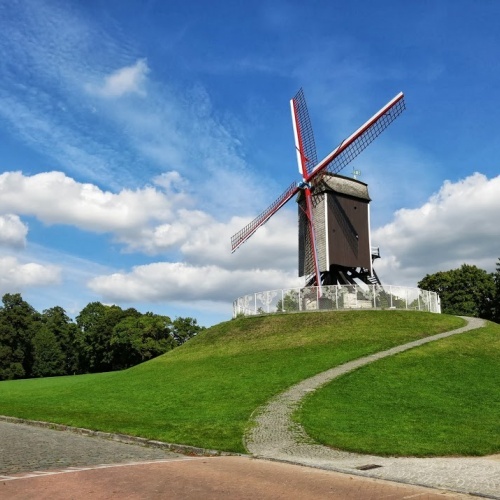 There are 4 old windmills set up along the old canals that are supposed to be nice photo spots as well. The kitchen was slammed last night. There were a couple giant groups that were all trying to cook at the same time (and the kitchen is pretty small). I ended up making my pasta with red peppers, listened to a Coffee Break French podcast then went up to my room to read and shower before bed. 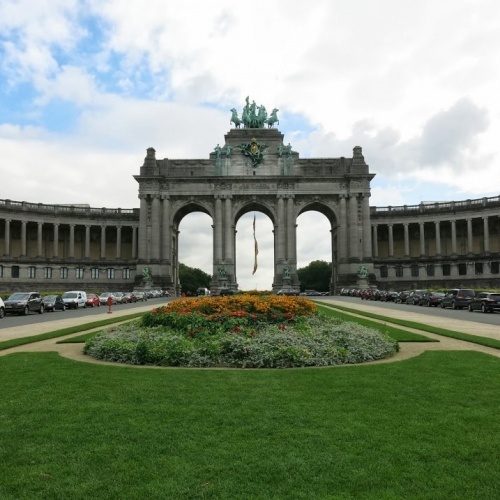 This morning I got up and had another chocolate croissant for breakfast then wanted to head out to the Parc du Cinquantenaire to see the Arc de Triomphe here in Brussels. I just checked the map and it should have been a 9.5 mile round trip but I got completely lost. I got so used to having a data connection and the ability to see where I was at any given time on the maps on my phone. After a couple mile detour I finally made it to the park and saw the Arc de Triomphe. The arc here is made up of three arcs where the one in Paris is a single arc. I had lunch at the park then went to the Central Station to buy my train ticket to get to Bruges tomorrow. 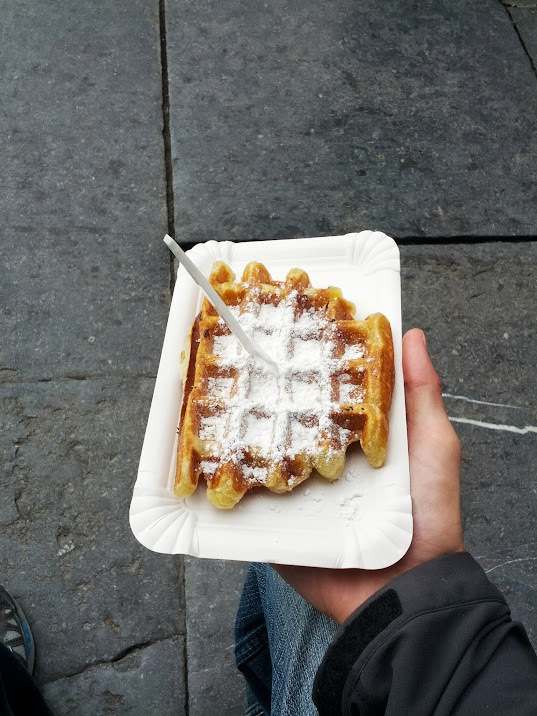 After buying the ticket I went over to the Grote Markt again in search of a Belgian waffle. I passed a few stands that seemed a little pricey but finally found one that looked good. I got a waffle with powdered sugar on it. The waffle was fresh out of the griddle and tasted amazing. 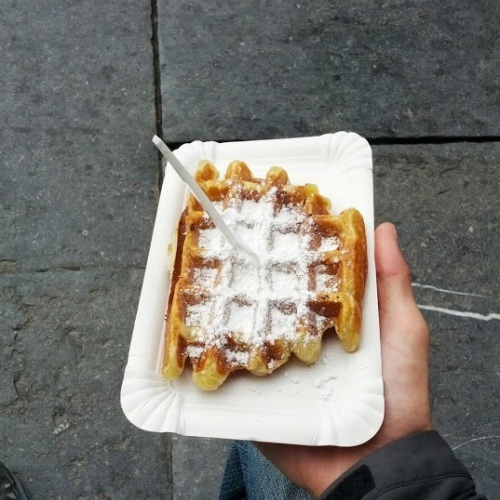 I ate the waffle in the Grote Markt then stopped by the Carefour express on the way back to the hostel to pick up some breakfast for tomorrow and some beers to enjoy tonight. I got a couple trappist beers and a random Belgian beer to sample. I've just been hanging out at the hostel now enjoying the beers and some grapes that I bought. I'll probably try to eat a little early in case the huge groups descend on the kitchen like a swarm of locusts again tonight. 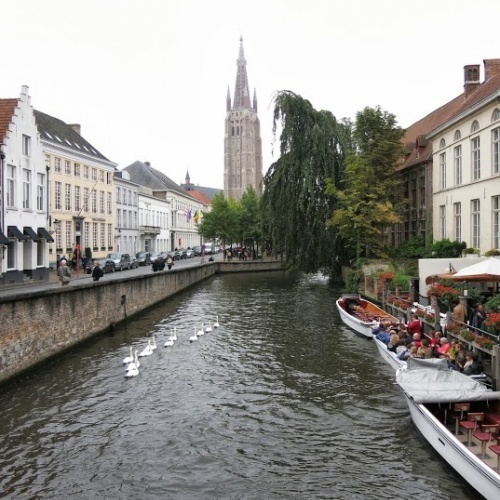 Tomorrow I head to Bruges to get the feel of a smaller Belgian city. Brussels has been fun but it definitely has that "big modern city" feel that I've come to be unenthusiastic about. 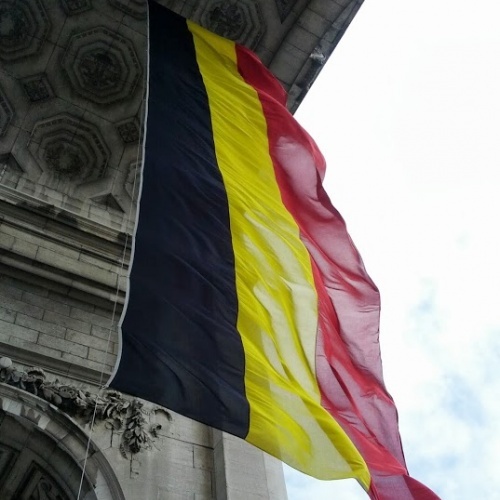 There are areas (like the Grote Markt) that have that old European charm, but it seems like a lot of Brussels could be mistaken for any other large city throughout the world. I ran out to a Carefore market to pick up some food for dinner and lunches over the next few days. I picked up some chocolate croissants for breakfast and some fruit to snack on. After that I went to Aldi and got what I thought was peanut butter but ended up being some kind of weird biscotti cookie tasting spread. It was alright at first but didn't sit to well later on. I had a couple beers, watched the latest episode of Breaking Bad, then went to bed. There was a couple in my room that was spending 2 weeks traveling around Europe from England. I talked to them a little bit then went to bed. 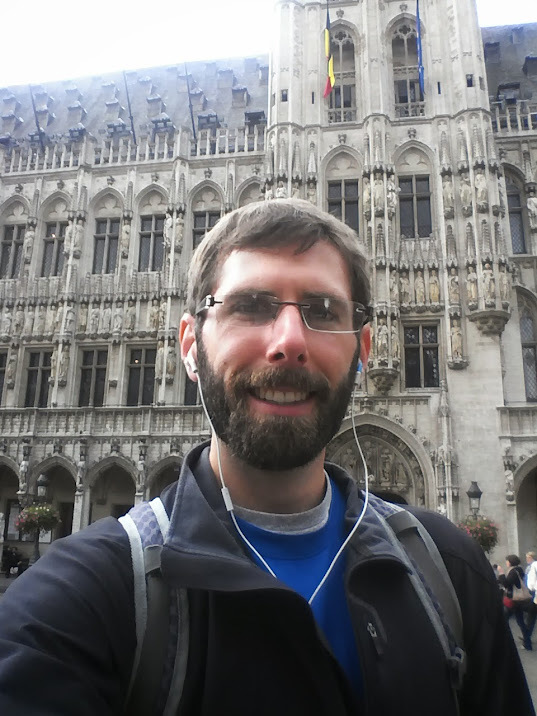 I was exhausted from traveling and walking all over Brussels so I slept really well. This morning I got up and had a croissant and some grapes for breakfast. The croissant was really good! I microwaved it for 30 seconds so the chocolate inside was nice and melted. I found some peanut butter in the shared food shelf at the hostel and used that to make a sandwich for lunch. I didn't want to have another one with that weird spread. 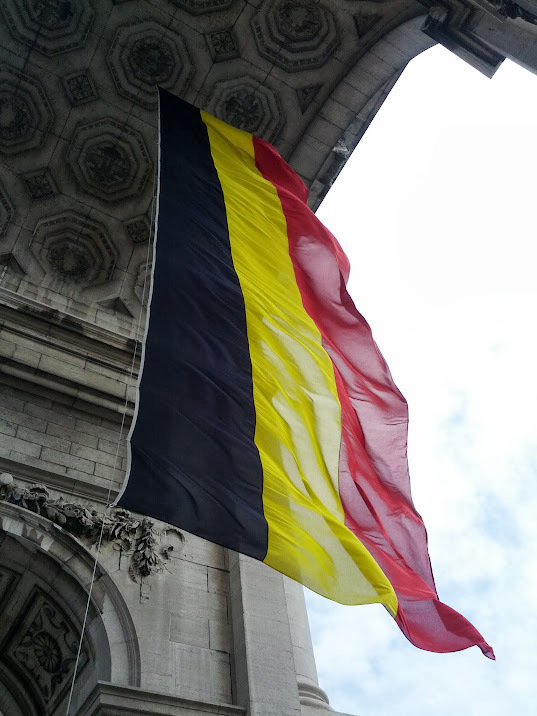 My plan for the day was to see a few of the sights and have some Belgian beers. I started off by going to the Manneken Pis fountain. 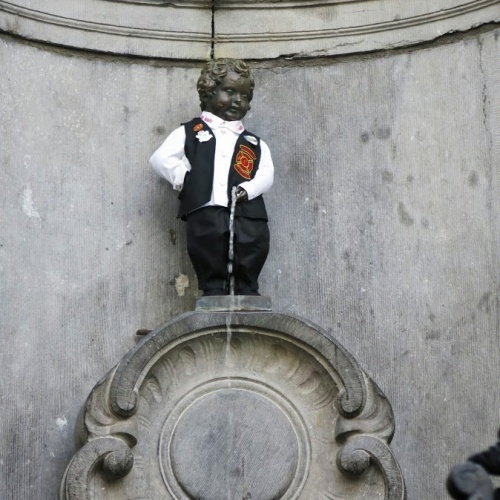 The fountain is of a little dude peeing and is supposed to represent the irreverent spirit of Brussels. It gets dressed up in a different outfit a few times a week. The fountain is tiny and is located in a random intersection in Brussels but it was pretty funny to see. I started walking toward Jubelpark which has Brussels version of the Arc de Triomphe but on my way it started to cloud up and look like it was about to pour again. 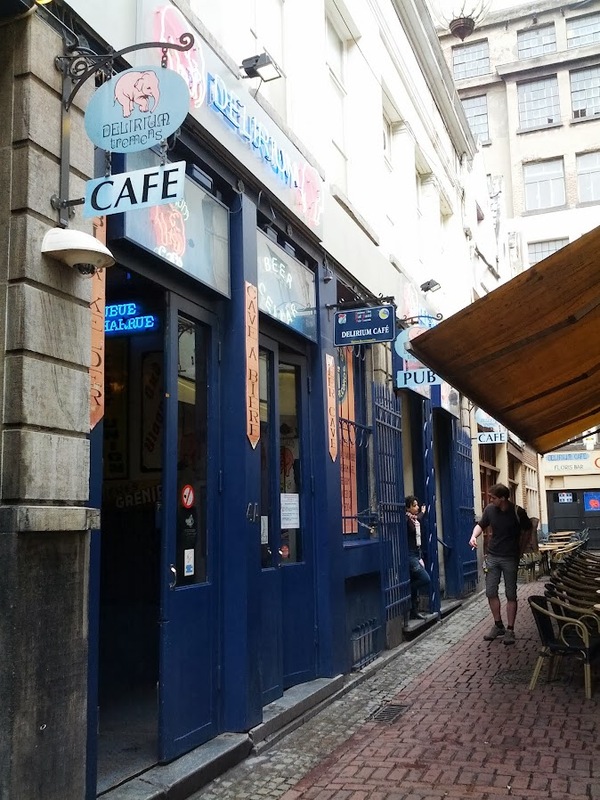 Rather than get caught in the same situation as yesterday I decided to eat lunch in the Grote Markt and then find a bar to have a drink at. 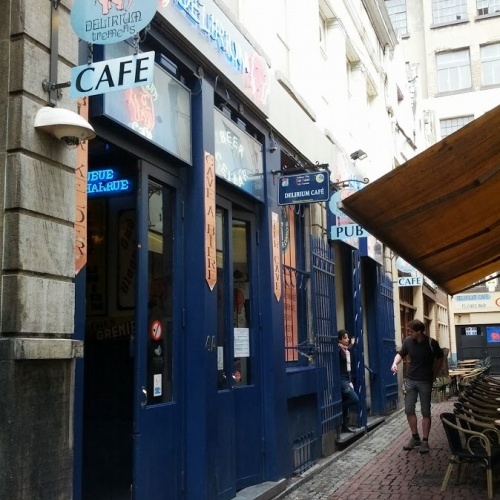 In my research I found the Delerium Cafe that has a Guinness World Record for most number of beers at 2400. I had a beer there, then went next door to their Monistarium for a trappist beer. It rained when I was in both of the bars so my intuition to drink instead of getting rained on was correct. 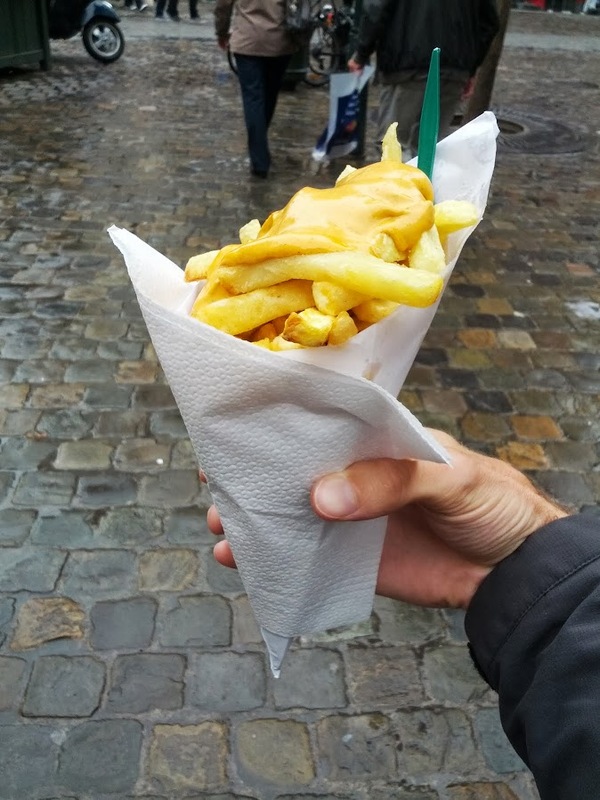 When the rain slowed down and I was finished with my second beer I set out to find some frites. I stumbled across the Friktos Tabora and got some frites with andalouse sauce. I think it's some kind of mix of mayo, ketchup and peppers. Whatever it was it tasted really good. It reminded me a bit of animal style fries at In-n-Out. Sufficiently happy after eating the frites I set off for another bar I found online called Moeder Lambic and had a beer there. Belgian beers really are good. I had 3 different beers today and each of them was different but really good. Also, the lowest ABV of any of them was 8%! I decided it was probably time to head back to the hostel so that's what I did. I stopped at a Lidl along the way and got a pepper, pasta and pasta sauce for dinner. I'll probably start making that in a little bit before the kitchen gets overrun. For tomorrow I'm thinking about getting a day pass for the metro so I can see more of the sights without getting rained on and stranded a few miles from the hostel. 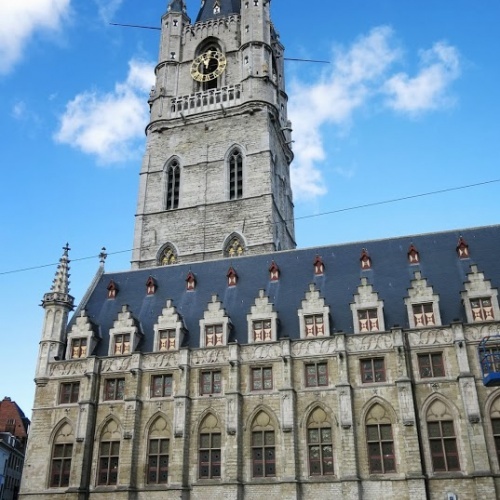 I also need to buy my ticket to Bruges tomorrow.